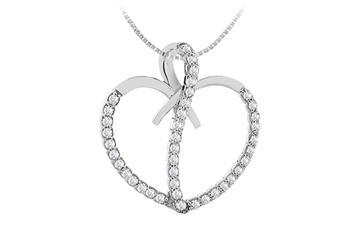 This gleaming heart pendant is accented with brilliant cut round diamonds and also a sleek diamonds line sparkling in the middle of the heart in pave setting. Perfect made in 14K white gold and has a total diamond weight TDW of 0.66 carat. It hang from standard 16 inches gold chain.